We help you in the process of getting your product to the market. With our experience in New Product Development (NPD), we develop the latest product ideas into final products ready to introduce into the market. To see how it works, have a look at these case studies to see how we developed a product from an idea to a finished, marketable product! 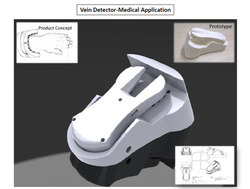 We are engaged in Design Development Prototyping including Medical Products Designs or Product Design for Medical Applications. Further, these services are given by the expert professionals, who hold vast experience in this domain. They make sure that they will develop the model as per the exact requirements and specifications of our customers. Owing to the timeliness, reliability and personalized approach, these services are widely acclaimed among the customer. Looking for Design Projects Services ?